What do chefs do in their spare time? Well when it comes to the Chefs at Dinner by Heston Blumenthal it's brew beer. Home brew might not produce the best results but when it’s created by two of the country's award winning chefs then that’s a whole different conversation. Head chef, Evan Moore and sous chef Max Gauthier-Beaudoin both started brewing their own beer on days off during their time working at Dinner London. Back then it was a rustic affair set up in Max’s share house. Now as the two chefs settled into their new life in Australia (Dinner is now 2 years old) their old hobby resurfaced. 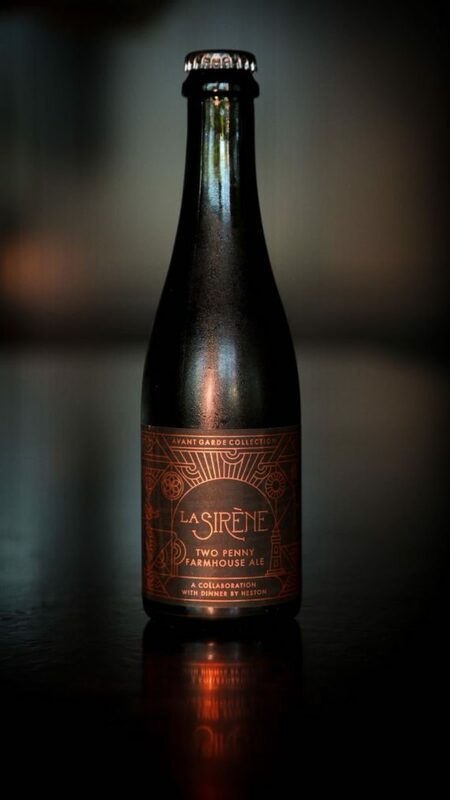 This time the two chefs got serious and partnered with La Sirene Melbourne brewery. The result is The Two Penny Farmhouse Ale exclusive to the bar at Dinner. The Two Penny is an incredible light farmhouse style ale, created by the palate and mind of a chef with the technical expertise of one of the most artisanal breweries in Melbourne. La Sirene is a family owned and operated urban farmhouse brewery next door to the Darebin Creek and National Park in inner city Melbourne. They use wild yeasts native to Victoria and brew in the traditional saison style but also focus on crisp drinkability. They are the perfect example of yeast in beers not just being a means to and end with regards to fermentation; they are just as important as hops and malt. Alongside head sommelier Loic Avril and head barman Darren Leaney the chefs headed to La Sirene to discuss what visions they each had for the Dinner beer. They were excited to find in Costa and Eva Nikias, the owners, genuinely friendly, generous and interesting people. They are obsessive about their craft and have a similar mentality to the team at Dinner so after a couple of visits ideas flowed easily and the process of creating a beer together felt totally organic. La Sirene were happy to use the expertise of the Dinner chefs, barman and head sommelier in the tasting process and in turn they taught them how to brew and encouraged them to do the work themselves in the shape of milling the grain, bottling the beer, and anything in between. The end result was all the more satisfying as the beer was made from start to finish with their own two hands. Costa created a recipe intertwining his saison method; traditional British ales and Australian hop varieties. All this would tie in with the British/Australian relationship between restaurant and brewery and the Two Penny Farmhouse Ale was born. Historically two pennies was the price at which a pint of this style of ale would be sold. In order to create a beer this exceptional hundreds of kilos of grain were rinsed time and time again to produce the wort, essentially unfermented beer. The wort is then infused several times with hops this where the magic of flavour and balance happens, live yeasts are added and finally it is tank fermented for minimum of a month. After a month the brewing process continues; first the sugar content is checked to see how much additional live yeast needs to be added to beer for the bottle conditioning. Once the yeast is adjusted, the beer is bottled. After bottling the beer is conditioned, or fermented, at 22°C for another month to achieve carbonation. After several weeks the fruits of their labour is a finished beer; crisp and easy drinking with hints of bright spices, yellow peach and yellow flowers like buttercup. The beer is constantly evolving so head sommelier, Loic Avril predicts that it will evolve into a more savoury, less floral beer with pine, wax and citrus oil notes. The Two Penny Farmhouse Ale is available exclusively at Dinner, Melbourne.